Really that's what I been saying for years. Spin the seats 180 and brag about rear steer.. If you do rear steering, shouldn't you be doing front wheel drive? Because you don't want the tires to have to do double duty. Well, then you probably want the weight of the engine over the front wheels, so you move it to the back of the corvette. Well now you're just driving a backwards corvette and it still doesn't have the engine in the right place. Last edited by AWDisFUN; 02-07-2016 at 10:52 AM. It’s time for an updated report on the mid-engine C8 Corvette, and here’s the game plan as we understand it from our impeccable source: The 2019 Chevrolet Corvette (code name: ZERV, perhaps chosen as an homage to Zora Arkus-Duntov’s 1960s mid-engine CERV concepts) will bow in production form at the North American International Auto Show in Detroit in January 2018 with a version of today’s pushrod V-8 engine delivering 450 to 500 horsepower. Expect a base price of approximately $80,000. When volume production begins, presumably later in ’18, today’s C7 Corvette will expire, although there should be remaining stock for those who prefer the traditional powertrain layout used for more than six decades. The C7’s final hurrah will occur at next year’s 2017 NAIAS, when a swan-song mega-power edition debuts, possibly wearing the illustrious ZR1 badge. A notable power upgrade to the C8 will occur in January 2019, attributable to a new four-cam, 32-valve V-8 set to be presented at NAIAS. That C8 surely will top $100,000. To continue building momentum, Chevy hopes to show, in 2020, a hybrid E-Ray Corvette—a term GM has trademarked—with electric front-wheel propulsion. C8 Corvettes may wear ZORA identification of some sort (such as ZoRa1) to pay homage to Zora Arkus-Duntov, the car’s spiritual godfather and mid-engine advocate from 1955 to 1975. Experimental C8s currently reside in Building 54 (a.k.a. Area 54) at GM’s Milford, Michigan, proving ground. Since we nabbed aerial photos of one test mule two years ago, prototypes seldom leave the building during daylight hours. GM owns two Ferrari 458 Italias for benchmarking, and the company once had a McLaren in its benchmark fleet. Also owned by the General: a Nissan GT-R, two Porsche 911 Turbos, and a BMW i8, any of which may be being used to aid in C8 development. So focus your eye-in-the-sky cameras on coordinates 42° 35’ 11” N and 83° 41’ 10” W—in the event you hit pay dirt, remember Car and Driver is information central for all there is to know about the next-generation Corvette. So are they bring the Corvette up to compete with the Ford GT? Makes sense as that would lift the ceiling for the Camaro, which seems to be creeping up on current Corvette performance territory. GM's performance team told GM management that they've reached the limit for a front engine rear drive platform. Either they go mid engine or their halo vehicle stagnates. It's more about building a better sports car / race car and less about other vehicles in their own stable. I guess these current Corvettes could end up being the equivalent of the last air cooled Porsche models. It’s been a while since we last heard about alleged plans for a mid-engine Chevrolet Corvette. A test mule for what appeared to be a mid-engine model of some sort was spotted at a General Motors Company [NYSE:GM] proving ground in early 2015. Since then the rumor mill has been quiet but Car and Driver has managed to dig up a few new details from one of its sources. Contrary to previous claims, also from Car and Driver, that the new Corvette, a C8 to all the fans, would bow in mid-engine guise in 2017 initially in high-performance ZR1 trim, the popular publication now reports the new Corvette will debut in 2018, at that year’s Detroit Auto Show. And instead of ZR1 trim the car is said to be initially arriving in base trim. The base model is said to once again be adopting one of GM's pushrod V-8s, with output hovering between 450 and 500 horsepower. More extreme versions, like a ZR1 or something similar, will eventually follow. Engines with dual overhead camshafts and even hybrid technology are possibilities. One crucial difference will be price. While the base version of the current Corvette starts below $60k, the new price of entry is said to be rising to approximately $80k. The higher price can be justified by the more exotic layout, plus it provides a nice buffer with the Camaro, which since the arrival of the sixth-generation model has been closing in on its big bro in both performance and pricing. The change will also help the new Corvette become a semi-exotic halo model for Chevrolet worldwide, similar to what the GT-R is for Nissan and the NSX is to Acura and Honda. 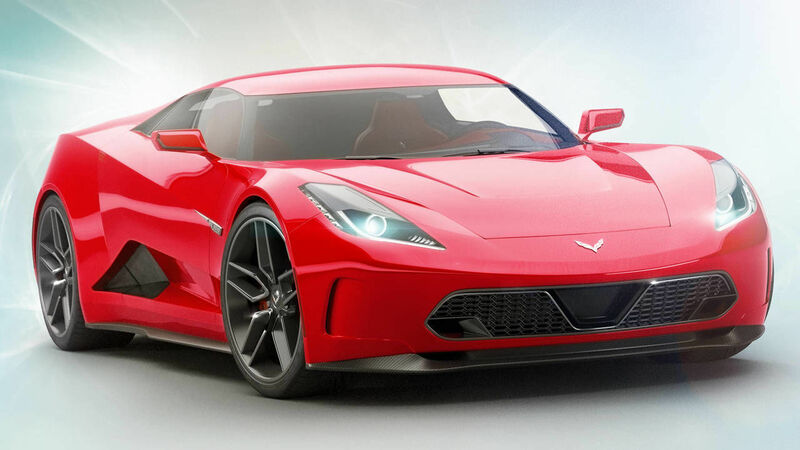 If accurate, it means the current C7 Corvette will likely be the last generation with a front-mounted engine. To send it off with a bang, it’s reported GM will introduce a model above the current Z06 at the 2017 Detroit Auto Show. I don't know if this is good or bad from a consumer point of view. The base vette with out options is still obtainable for most average income people which was always appealling. Going forward nit so much. Guess time will tell. Maybe upper-trim Camaros fill that void. I hope they fix the steering feel - biggest thing that kept me out of a vette over the years - ZR1 had the same steering feel as the Suburban. I agree, right now, you see corvettes everywhere... and that's a good thing! Yeah, most of them are base models, but the Z06's and ZR1's are like easter eggs for those who follow high performance cars. For people who don't, they see it and think, "Ooohh, a Corvette!". It's a win-win for Chevy. If they bring the entry price up, they will loose all the people who pay $50K for their base model, and then they have a tough sell for people willing to spend big bucks on a sports car. A lose-lose. Nothing is official yet, but sources familiar with the matter told Motor Trend that the naturally-aspirated 7.0-liter V8 engine (called LS7 in Chevrolet-speak) found in the previous Z/28 and the last-gen Corvette Z06 will power a new model in the not-too-distant future. The engine's output will lie in the vicinity of 550 horsepower thanks to direct fuel-injection, modified cylinder heads, and new cams. Performance specifications haven't been published yet. As has historically been the case, the V8 will be complemented by a firmer suspension and bigger brakes on both axles. Visually, the Z/28 will receive a muscular-looking body kit, four round exhaust tips, a huge wing mounted to the trunk lid, and specific alloy wheels. Chevrolet is keeping technical details about the next Camaro Z/28 under wraps, so we'll have to wait until the veil is lifted to find out what's under the hood. When it lands, the next Z/28 will fight head-to-head against the Ford Shelby Mustang GT350, which uses a 5.2-liter V8 with a flat-plane crankshaft to generate over 500 horsepower. Just looking at the article and map of GM proving grounds again. Building 54 is rented by Nexteer. It's on the grounds, but as far as I recall it's not directly used by GM other than one or two bays for durability vehicles. Anything coming in and out of that building is likely for steering development / calibration. The performance car group is located with the rest of the product development teams. It's the building with the white roof just off the top right of the road course (bottom left of that image). Within the building is a 140 bay garage. What I don't understand about that article is why they rotated the image. Right is North. Wow, upgraded LS7 in the Alpha platform sounds great. Let Hyundai and Kia come play and prove themselves as well. They have a good 5.0 to start with. With the muscle car battle in full swing, we really need to bring back trans am racing. But with some new rules. Cap the engine displacement at 5.0 liters. They must be Normally aspirated and then let the engine boffins at Ford and GM loose. Maybe Alfa would get in the game (I know pipe dream), but maybe lexus would. With the muscle car battle in full swing, we really need to bring back trans am racing. I guess that bodes the real question..
Last edited by SCRAPPYDO; 05-16-2016 at 01:35 PM. I think it simply isn't televised often, and that's likely because it's been falling in popularity and lacking factory backed teams. I remember many years ago they blocked off the city streets in Grand Rapids, MI to make a racing circuit. Trans Am was the headline event with the original Speed World Challenge being the support series. With all the big names in PWC it bring in a lot more money. The season would be a series of north and south American tracks so Canada and Mexico can get some time as well. Mexico is in North America... In fact, all of Central America is part of North America, along with all of the Caribbean Islands. But I get what you're saying, TransAm should be a continental series. The mid-engined version of everyone's favorite American sports car, the Chevrolet Corvette, is coming. Or at least, a lot of auto industry folks think it's coming, thanks to all the rumors, leaked info, and test mules that have been spied recently. After decades of speculation and renderings, this is what we know so far about the most fervently anticipated American sports car in history. There have been rumors about Chevrolet developing a mid-engine Corvette for half a century. Indeed, Chevy has built a number of mid-engine concepts through the years, only to abandon them somewhere in development. The first official prototype was revealed all the way back in 1970, and it was nearly production ready. In 1986, GM showed off the Corvette Indy, complete with a mid-mounted twin-turbo V8 and all-wheel-drive. Then, in 2002, Cadillac revealed the stunning Cien concept at the Detroit Auto show. In between the Cien's axles, behind the passengers, was a 7.5L V12 with 750 horsepower. It wasn't branded as a Chevy, but industry watchers took it as a sign that GM wanted to do something big. In 2004, it was decided that the Corvette had reached the limit of grip with the traditional front engine, rear-wheel-drive layout. As Bob Lutz explains, the design team got as far as constructing two full-scale clay models, a Corvette and the equivalent Cadillac XLR, both with the engine in the middle. Sadly, the recession of 2008 (and GM's eventual government bailout) caused the automaker to put a hold on, and eventually cancel, this mid-engined Corvette project. Now, development on the C7's replacement has begun, and rumor has it, a mid-engine variant is in the works. Mark Reuss, head of Global Product development, says that the C8 will be "revolutionary." To some Corvette watchers, that can only mean one thing: a mid-engine Chevy supercar. One of the key factors behind sales of the Corvette is it's outstanding value. With a starting MSRP of only $55,400, the current C7 represents a great deal for those who want fun and performance without having to drain their kids' college funds. Obviously, the mid-engined variant would cost more—probably a lot more, since it would require an all-new platform redesigned from the ground up. $150,000 seems to be the most popular number floating around, which is nearly double the starting price of the current Corvette king, the Z06. While that number undercuts the Ford GT's MSRP of $450,000, that's still quite a bit of money for a Corvette. It's been suggested that there will still be a cheaper front-engined variant sold alongside the new mid-engined car, so as not to alienate any loyal fans or prospective buyers. Since it is still a Corvette, expect a V8 to be present (perhaps something more modern than the traditional pushrod layout), though some wild rumors suggest a turbocharged V6 option could also be offered to bring the price down. Since the engine is going to be sitting behind the cabin, the car will look quite different from the traditional Corvette layout. Our friends at Car and Driver recently snagged spy shots of what looks like a C8 Corvette prototype testing, with several design cues that indicate a mid-engined layout. The cabin is far forward, with a longer rear section. There's also a set of flying buttresses present, a popular aerodynamic feature on new mid-engined cars, such as the McLaren 570S and Ford GT. Although it'll bear the Corvette name, the hypothetical mid-engine C8 will be radically different from the car it replaces. The only reason the Corvette would switch to a mid-engined layout is for performance. Engineers at GM understand that there is a limit to how much power a front-engine supercar can put down, and how much cornering grip it can achieve. Although the current Corvette Z06 is a fantastic sports car, it's inherently held back by its front-mid-engine layout. With the engine in the middle, the car's weight distribution can be optimized, with turn-in and corner holding capabilities benefitting as a result. The mid-engine Corvette has long seemed like a fantasy, a daydream promoted by automotive journalists, Corvette loyalists, and those who want to see an American automaker finally build a direct competitor to the likes of Ferrari and Lamborghini. Recent evidence suggests that this wish could finally come true. While we're hesitant to call it a sure thing, we think there's a strong likelihood it could happen. And we can't wait to get our hands on it. If they come out with a mid-engine car, just don't call it a Corvette. That name should for ever be synonymous with a F/R sports car.